Twitter has gained great notability and popularity worldwide in recent years. Some people even call it ‘The SMS of the Internet’ solely because the interface for sending and receiving text messages by other applications often eclipses the direct use of Twitter. Well, if you have an account on Twitter and you feel that your tweets are awesome or you need to save them then here are a few Twitter account backup tools that I would like to share with you. It’s a web based tool that allows you to backup your Twitter profile. You can backup your friends, followers, tweets, favorites and DM’s. 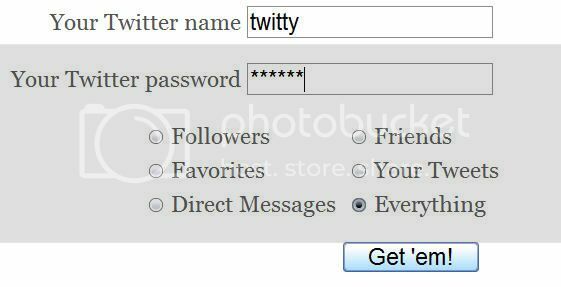 TO backup all you need to do is enter your Twitter login id and password and click on the ‘Get em’ button. Before using this service make sure that if you are running Tweetdeck or a similar Twitter shut it down or else Tweetake won’t work. TwitterBackup is a desktop tool that downloads all your tweets and stores them in XML format. It’s a .jar file, hence you don’t need to install anything. Download it and double-click the twitterbackup-2.6.jar file. If it doesn’t start, try opening a command prompt/shell and type java -jar twitterbackup-2.6.jar.